Beginning with the 1979 Shi'i Iranian revolution and the subsequent success of the Sunni mujahideen's resistance to the Soviets in the 1980s, acts of violence committed in the name of Islam have risen sharply. Increasingly, the role of martyrdom has taken a central position in violent campaigns conducted by Islamic groups. The suicide bomber has become the ideal of Islamic martyrdom, simultaneously appalling Western audiences and captivating Islamic ones. What seems to have gone unnoticed, however, is how the concept of Islamic martyrdom has undergone a transformation that blends and synthesizes notions that were once limited to one or the other of the main Muslim sects. In order to better address the challenge of Islamic violence, it is necessary to examine both the Islamic world's attachment to such behavior and to understand better how the role of the martyr has changed with the times. 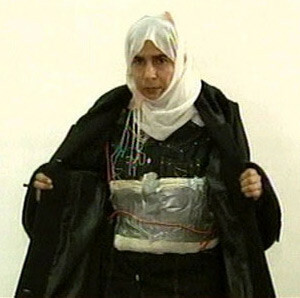 A Palestinian woman wears a suicide belt. Islamic law allows women to engage in jihad when the Muslim state comes under attack. In recent years, women have volunteered for membership in a range of terrorist groups including Hamas and Islamic Jihad. In April 2005, the Iranian regime created a unit of female suicide bombers nicknamed the Olive Daughters. An Iranian website announced that these women were following in the footsteps of the "holy female Palestinian warriors." Martyrdom in Islamic history has taken on a variety of shapes and relied on numerous contexts for justification and implementation. Over the last century, new strains of martyrdom have moved across the umma (the global Islamic community) from Mandatory Palestine, French Algeria, and revolutionary Iran to everywhere between Morocco and Indonesia. Evolutions in martyrdom's place within Islamic thought expose shifts within Muslims' own sense of self as well as changes in culture. In Arabic—Islam's sacred language—several words refer to variations on the concept of the martyr. Shahada, often translated as "martyrdom," literally stands for the act of "witnessing," and depending on context, it can mean the "confession of one's submission to God" or "death for God's sake." Istishhad literally refers to the act of martyrdom. Shahada then refers to incidental death during jihad (i.e., a soldier falling in battle) whereas istishhad indicates deliberate death during jihad. The former connotes a "willingness to die," the latter an explicit "eagerness to die." Today, shahid best describes one who dies during jihad rather than one who simply dies for Islam. In popular usage, the shahid refers primarily to the perpetrators of suicide attacks but has expanded to include those deemed martyrs by Muslim society at large, i.e., participants in jihad who have died one way or another. Palestinian society views both the shahid and the istishhadi as martyrs who deserve the rewards of paradise. Indeed, Palestinians often speak about both the istishhadi (one who puts himself forward knowingly to die during jihad) and the shahid (one who incidentally attains martyrdom during jihad) as shuhada' (martyrs). These terms are embedded within a surrounding "culture of martyrdom," a phrase often applied to some contemporary Muslim societies, whether a relatively small one like that of the Palestinian Arabs or a larger, transnational one, like Al-Qaeda and its so-called affiliates, that promote self-sacrificial terrorism, including suicide bombings and other "martyrdom operations." The culture of martyrdom also refers to those elements such as music videos, popular poems, textbooks, rallies, memorabilia, etc., that support ideas of jihad, shahada, and istishhad, or commemorate a past shahid. Less tangible elements such as popular acceptance and praise of shahids as well as other forms of popular consent, (e.g., limited or no condemnation by authority figures) are aspects of the culture. Such a culture has roots deep in Islam's historical narrative. One major trajectory for martyrdom's importance within the Muslim tradition derives from the Shi'i narrative that developed following the death of Muhammad's grandson Hussein in 680 CE. Hussein and his followers did not choose martyrdom at the Battle of Karbala in the manner of most other Islamic martyrs in successive generations. Nevertheless, Shi'i tradition embellishes his death with prophetic foreknowledge of the outcome. It also embodies the model of a woefully small force of true believers arrayed against an overwhelming army of "evil-doers." As a result of his death, the role of martyrdom would forever serve as a basis for the distinction of Shi'ism from Sunni orthodoxy. Hussein's death has since demonstrated the extent to which martyrdom proves one's commitment to an Islamic cause. This gives it a capability like none other in political Islam: the power to affect ideological change from within. The martyrdom of [Hussein] provided an opportunity to denounce the usurpers so as to reestablish the true religion of [Muhammad]. In this case, the relationship between martyrdom and jihad is ambiguous, as self-sacrifice was not made when victory was in sight. On the contrary, it resulted in temporary defeat. The Ismaili Assassins, a Shi'i offshoot of the eleventh and twelfth centuries, represent a further step in that trajectory as an example of Muslims who identify themselves so differently from the ruling sect that violence and death became the most desirable option for pursuing their collective goals. In pursuit of political change, the Assassins combined Shi'i martyrdom with the Islamic concept of taqiyya or deception, taking the conventions of resistance in new directions. Responding to their oppression at the hands of Sunni caliphs, the Assassins refocused their allegiance on their sect rather than their more encompassing Islamic faith. Most significantly though, by later targeting Crusader officials, the Assassins introduced Islam's brand of martyrdom to the West as an inter-civilizational tool of warfare and political messaging. A second, significant trajectory is that of the dominant, Sunni perspective on jihad and the Sunni understanding of martyrdom. While always present, Sunni martyrdom within the framework of jihad remained mostly stagnant for hundreds of years as Sunnis largely enjoyed the power of the majority. This began to change in the eighteenth and nineteenth centuries with Western dominance over territory formally under Islamic control (Dar al-Islam) and most significantly with the influx of mainly European Jews into Palestine. Their arrival was often perceived as a challenge to Muslim hegemony by local Sunni leaders. Although suicide terrorism has become a major feature of modern jihad, it has its roots in earlier concepts of the shahid who goes into battle determined to kill as many of the enemy as possible in the knowledge that he will die. The martyr's death is constantly presented as the perfect way for a Muslim to die, and this conviction has, in the modern period, given rise to the phenomenon of a self-detonating shahid, especially among Palestinian fighters. With the Zionist settlement of Ottoman-ruled southern Syria, later British-controlled Mandatory Palestine, and the eventual establishment of the state of Israel in 1948, the political geography of the Islamic world was dramatically reformatted, giving rise in turn to new notions of how to wage a "defensive jihad." A key catalyst to nascent Arab nationalism proved to be the "us-versus-them" scenarios that played out in confrontations between Jewish immigrants and the local Arab population. In direct response to the growth of the yishuv (the pre-state Jewish community and its leadership), the Arab population—also made up of many newcomers from various places in the Arab world—began constructing its own national identity. But the leaders of this Arab community were simultaneously religious leaders (e.g., the Grand Mufti of Jerusalem Hajj Amin al-Husseini, Sheikh 'Izz al-Din al-Qassam), and the conflict over Mandatory Palestine was soon framed in terms of Muslims versus Jews. At the center of this identity stood its hero—the shahid. Muslims who died opposing the Zionists were "martyred" and ascended to national hero status within the population. In the decades after Israel's establishment, Palestinian Arabs placed ethnic or national identity ahead of their Islamic identity because Muslim leaders had failed them and Arabism seemed to offer a more promising future. Yasser Arafat's Fatah guerrilla group began employing the traditional Sunni notion of a feda'i (self-sacrificer) to define their fearless revolutionaries, who opposed the imperial powers through guerrilla warfare and terrorism, replacing the religious shahid in the national consciousness. A feda'i or mujahid (one who wages jihad) displays a willingness to sacrifice his life for Islam but usually seeks to fight for as long as possible and does not court death as an end-goal. The use of feda'i served another purpose as well. Fatah and others within the umbrella of the Palestine Liberation Organization (PLO) shaped their political message with the vernacular of the international environment in mind. The Cold War, the rise of Arabism, and the strategic and ideological compatibility of Palestinian revolutionaries with the Soviets influenced the PLO's manner of framing its struggle. While the PLO took on an identity that allowed it smoother access within the international system, it did so without compromising its positions regarding martyrdom. The PLO never became any less Islamic or Arab internally. The Sunni tradition of martyrdom may have temporarily moved to the background, but it still remained an animating force, mobilizing the PLO's resistance to Zionism by having its fighters engage in risky, nearly suicidal operations. Throughout the 1950s and 1960s, Palestinian groups sat at the forefront of modern terrorism, and their fedayeen martyrs remained central to their strategy of political extortion. The term jihad, however, seemed to disappear from the framework. This was not a particularly Palestinian phenomenon. Historian David Cook notes that "the muted use of jihad held throughout the Muslim world until the rise of political Islam after the Six-Day War with Israel in 1967." However, in the 1970s, the Muslim world woke up to a new era. Secularist alternatives to tradition, such as pan-Arabism, had either been found wanting or were associated, like Baathism, with repressive regimes. Israel had roundly defeated Arab states in war, particularly in 1967 and in 1973. Most significantly, a revolution in Iran in 1979 resulted in the rise of a religiously-oriented regime that showed itself able to confront the "Great Satan," the United States. This did not go unnoticed in the larger, Sunni world: By the mid-1980s, a coalition of Sunni warriors from several countries was fighting and eventually defeating Soviet forces in Afghanistan. Meanwhile, Khomeini's use of shahada within the Iranian revolution and the Iran-Iraq war demonstrated the ability of martyrdom to advance an Islamic cause. Without the thousands of volunteers who blew themselves up clearing Iraqi minefields, one can never know with certainty if Iran could have staved off Iraq's mechanized encroachments. Using the power of identity politics, Khomeini cast the shah, and subsequently Saddam Hussein, in the role of Yazid, the slayer of Hussein at Karbala and thus the explicit enemy of all Shi'a. The needs of revolution and war led Khomeini to call for acts of martyrdom. Inadvertently perhaps, the exigencies that led Khomeini and the Iranian Revolutionary Guards Corps to mobilize waves of self-sacrificers served to expand the parameters of the culture of martyrdom. Soon thereafter, Iran's agent in Lebanon, Hezbollah, advanced notions of Shi'i martyrdom in its own right, perhaps more significantly than revolutionary Iran did. Hezbollah's superimposition of the shahid onto the figure of a suicide-bomber completely altered the contemporary direction in the uses of Islamic martyrdom. The act of an individual directly killing him or herself while killing others, whether U.S. troops in Beirut or Israeli troops in southern Lebanon, reinvigorated Islamic martyrdom. Moreover, this evolution was to have an immeasurable effect on political Islam within both Shi'i and Sunni spheres. The structure of the conflict pitted Hezbollah against much more advanced forces, highlighting the advantages of using the shahid to attack soft targets. Culture and identity also played a part in Hezbollah's successful importation of Iranian ideas and tactics: the Shi'a were the traditional low men on the totem pole of Lebanon's confessional politics and met Khomeini's concept of martyrdom with unexpected levels of enthusiasm. both shahid and fida'i are motivated by a profound and numbing religious fanaticism, which pushes them to commit acts of self-sacrifice, which we usually refer to as "suicide attacks"... However, while the shahid is a martyr in the sense that he is serving a cause, the fida'i connotes more of a devotion to a leader. Thus the focus of Islamic martyrdom shifted from the specific to the universal, moving away from the established organization member to any individual who aspired ad hoc to answer the call of jihad. In late 1992, as a response to the seemingly endless first intifada, Yitzhak Rabin's Israeli government made the mistake of deporting some of the uprising's leaders and other Islamic Palestinian activists, including both Hamas and Palestinian Islamic Jihad (PIJ) members, to southern Lebanon. Under the auspices of Hezbollah and the Iranian Revolutionary Guards, these Hamas and PIJ members learned the functional elements of suicide attacks and matured their understanding of martyrdom operations. Compounding its mistakes, the Rabin government allowed many of the 418 deportees to return to the disputed territories by the end of 1993. By no coincidence, Hamas and PIJ attacked Israel with suicide bombers a combined eight times during 1993 alone. The transmission of the Shi'i shahid/suicide bomber to the Sunni world marks the full convergence of the two historical trajectories. The mid-1990s ushered in a period when Hamas and PIJ transitioned potential martyrs from rock throwers and gunmen to suicide bombers as well as shifted Palestinians' support from shahada (incidental death) to istishhad (deliberate death). Not to be outdone, Arafat's nominally secular Fatah adopted the istishhad approach. By the time of the Aqsa intifada in 2000, Palestinian organizations had injected esoteric Shi'i concepts into the Sunni world of martyrdom, including pre-attack rituals initially developed in Iran and Lebanon. The Sunni adoption of a Shi'i form of martyrdom has led to a hybrid version that takes the most virulent components of each. Superimposing the jihadi martyrdom of Sunni tradition onto the self-annihilating Shi'i version has contributed to the brutality and audaciousness of acts of martyrdom committed by Palestinians and the international jihadi movement. Interestingly, in the late 1980s, Hezbollah came to recognize the negative social potential of mass istishhad, and its spiritual advisor, Mohammed Hussein Fadlallah, accordingly issued a fatwa (Islamic religious ruling) authorizing its practice "only on special occasions" in order to prevent "exaggerated use [by] overzealous youth." With the growing importance of the Palestinian cause to the Sunni world, at least on a popular level, Palestinian promotion of Hezbollah's virulent shahid/suicide-bomber modus operandi received support and inspired others. The structure of the Israeli-Palestinian conflict, framed as one between Jews and Muslims, helped foster international support for the new type of martyr. In turn, widespread support for this type of attack, against civilians and on a mass scale, led to the construction of a new Sunni culture of martyrdom across the global Islamic community. Inevitably, as respected Sunni leaders such as Sheikh Yusuf al-Qaradawi and entire Arab societies sanctioned Palestinian suicide terrorism against Israeli civilians, it opened the door of legitimacy for other Sunnis to engage in similar acts. Though neither the Afghan mujahideen nor their Arab partners used any form of suicide attack during the jihad against the Soviets, Palestinians did inspire Al-Qaeda and others within the international jihadi movement to adopt not only the suicide-terror tactic but also the complementary istishhad strategy. Al-Qaeda and others have mobilized Sunni shuhada'-suicide bombers for their own cause. Framed on a global level, Al-Qaeda has unleashed its weapon against all who do not fit its own identity grouping, including fellow Muslims and particularly the Shi'a. In Iraq, a role reversal of titanic portions has occurred. While Palestinian martyrdom operations, the attacks of 9/11, and subsequent Al-Qaeda-inspired violence targeted Western foes, the Shi'a represented the target of choice in Iraq. In Iraq, Sunni organizations have effectively advanced Shi'i concepts of martyrdom and now use them predominantly against Shi'i targets. Al-Qaeda's capability to export the Palestinian form of martyrdom on a worldwide level is sure to leave a greater path of destruction and despair than it already has. At some point, martyrdom seems to have become the primary goal within the Palestinian arena, reducing to secondary importance the stated objectives that initially encouraged the act. As with the international jihadi movement, political objectives may be maintained at the organizational level, but on the operational level, fixating potential martyrs on the act itself remains the fundamental goal. The vogue for martyrdom can also be analysed in terms of fashion: The wish to imitate the other in death was a constant feature of young people in the [Iranian] revolutionary movement because it allowed them to take on a collective identity, to look different to others, and to establish a new hierarchy of the heart rather than a social hierarchy. The international jihadi movement has to a degree restructured the relationship between the Islamic community and its spiritual and temporal leaders, incorporating Muslims into a bottom-up political movement of martyrdom operations, in which they can decide to actively participate at any time. Perhaps not since the death of Hussein have notions of martyrdom caused as drastic an evolution in political Islam as has the suicide-bomber. Martyrdom has become a central concept within contemporary political Muslim discourse and has assumed the role of the dominant cause rather than the consequential effect in its relationship with political Islam. Its most notable adherents are now the members of the international jihadi movement, increasingly bolstering their claim that they are the true representatives of the global Islamic community. Al-Qaeda's sustained targeting of the Shi'a could lead to the use of Islamic martyrdom as an internal Islamic tool used to eliminate inter-sectarian rivals in addition to a weapon for use against non-Muslims. Concepts of martyrdom have played important roles throughout Islamic history, and today's "martyrdom operations" display the continuing importance of the phenomenon as an expression of Islamic grievance and as a form of religiously-motivated armed combat. For many political Islamic groups today, the martyr stands at the pinnacle of resolving intergroup conflict. Heroes represent a group's ideal member, and the idea of ordinary individuals achieving extraordinary feats captures the attention and inspires many to answer the call of their group—especially in the face of conflict with a perceived encroaching enemy, whether a U.S. soldier or a Shi'i politician. Now, the acts of suicide-homicide martyrs epitomize heroism for many jihadi organizations. Accordingly, one should expect support for and participation in violent acts of martyrdom to continue to increase in the Sunni world over the foreseeable future. Benjamin T. Acosta is currently working on a Ph.D. in political science and cultural studies at Claremont Graduate University. Jon Elster, "Motivations and Beliefs in Suicide Missions," in Diego Gambetta, ed., Making Sense of Suicide Missions (New York: Oxford University Press, 2006), pp. 237-8. Yasser Mahmoud Ali Abu Bakar, cited in "Suicide Bombing Terrorism during the Current Israeli-Palestinian Conflict: September 2000-December 2005," Intelligence and Terrorism Information Center, Ramat HaSharon, Jan. 1, 2006, pp. 7-8. Benjamin T. Acosta, "Palestinian Precedents: The Origins of Al-Qaeda's Use of Suicide Terrorism and Istishhad," in Joseph M. Skelly, ed., Political Islam from Muhammad to Ahmadinejad: Defenders, Detractors, and Definitions (Santa Barbara: Praeger Security International, 2009), pp. 198-9. Farhad Khosrokhavar, Suicide Bombers: Allah's New Martyrs, David Macey, trans. (Ann Arbor: Pluto Press, 2005), p. 21. Denis MacEoin, "Dimensions of Jihad: Suicide Bombing as Worship," Middle East Quarterly, Fall 2009, pp. 15-24. Benny Morris, Righteous Victims: A History of the Zionist-Arab Conflict, 1881-2001 (New York: First Vintage Books, 2001), pp. 113-4; idem, The Birth of the Palestinian Refugee Problem Revisited (Cambridge: Cambridge University Press, 2004), p. 10. Benny Morris, 1948: The First Arab-Israeli War (New Haven: Yale University Press, 2008), pp. 34, 67, 209, 395; idem, One State, Two States: Resolving the Israel/Palestine Conflict (New Haven: Yale University Press, 2009), pp. 52-4, 103. Bruce Hoffman, Inside Terrorism (New York: Columbia University Press, 2006), pp. 64, 71-9. David Cook, Martyrdom in Islam (New York: Cambridge University Press, 2007), p. 136. Raphael Israeli, Islamikaze: Manifestations of Islamic Martyrology (London: Frank Cass, 2003), p. 75. Ami Pedahzur and Arie Perliger, "The Changing Nature of Suicide Attacks: A Social Network Perspective," Social Forces, June 2006, pp. 1987-2008. Scott Atran, "Genesis of Suicide Terrorism," Science, Mar. 7, 2003. Hoffman, Inside Terrorism, p. 148. Jessica Stern, Terror in the Name of God: Why Religious Militants Kill (New York: Harper Collins, 2003), p. 47. Mohammed M. Hafez, Manufacturing Human Bombs: The Making of Palestinian Suicide Bombers (Washington, D.C.: U.S. Institute for Peace Press, 2006), p. 41-2. Rafael Israeli, "A Manual of Islamic Fundamentalist Terrorism," Terrorism and Political Violence, Jan. 24, 2002, p. 30. Acosta, "Palestinian Precedents," pp. 193-204. Mohammed M. Hafez, Suicide Bombers in Iraq: The Strategy and Ideology of Martyrdom (Washington, D.C.: U.S. Institute for Peace Press, 2007), pp. 5, 75-8. David Brooks, "The Culture of Martyrdom: How Suicide Bombing Became Not Just a Means but an End," The Atlantic Monthly, June 2002. Khosrokhavar, Suicide Bombers, p. 101. Related Topics: Radical Islam, Suicide terrorism | Summer 2010 MEQ receive the latest by email: subscribe to the free mef mailing list This text may be reposted or forwarded so long as it is presented as an integral whole with complete and accurate information provided about its author, date, place of publication, and original URL.